The search results display in a table of thumbnail images with a line or two of information from each record (e.g. GloPAD ID, piece name, component type, or names of the people represented). Click on either the ID number or the thumbnail image to display the full record of information. Click on hyperlinked names to view further records of information about related pieces, productions, and people. While in the full record, click on the thumbnail or the "image" tab to access the digital object, which may be a still image, audio or video recording, or 3-D model. We are developing features for browsing by performing arts genre, geographical region, and time period, in addition to advanced search options. Please contact us with suggestions for specific browse and search mechanisms that you would like us to include. 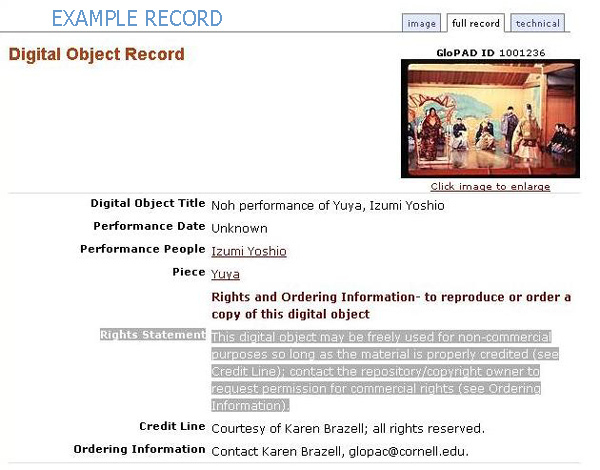 Every digital object record on GloPAD contains information on how you may use the digital object under the heading "Rights and Ordering Information." If an object record does not include a rights statement or ordering information, please contact GloPAC. The rights statement tells you how you may reproduce the digital object. Whether you may use the object freely, only for temporary, non-commercial, and educational purposes, or may not reproduce the object at all. Credit Line: Courtesy of Karen Brazell; all rights reserved. Ordering Information: Contact Karen Brazell, glopac@cornell.edu. GloPAD works in Unicode. If you experience problems viewing text in Russian, Japanese, German, or Chinese, make sure your browser encoding is set to UTF-8. For searching in non-roman scripts use the text search on the Search/Browse page. See the demo movie on using the GloPAD text search. In order to view the 3-D models on GloPAD, your browser must have a plug-in installed that allows you to view VRML files. The National Institute of Standards and Technology Web site lists such downloadable plug-ins by operating system and browser.